The delivery is a bit different this month. For every two cards, I include some text describing the significance of each of the two cards. There's a lot of great stuff in this list so let's get right to it. 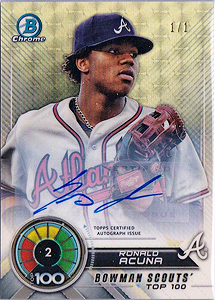 Ronald Acuna introduces the list this month with an incredible Superfractor sale. Even with the sticker auto, it's still a very solid card. I'm not at all shocked by the end price and look forward to watching more of his stuff. 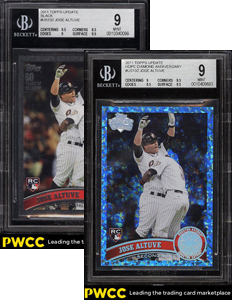 It was nice to see both elusive parallels of the Jose Altuve 2011 Topps Update RC get listed this month. They both ended right around the same time and with strong finishes. After a brief survey with other collectors, I discovered many of us prefer the Hope Diamond over the Black border. There's something wondrous about that blue sparkle design; I really love those. That's not to say the Black border is any less desirable. Both have print runs of just 60 examples. The Alex Bregman 2010 Bowman Chrome Red Refractor was actually listed twice, that same exact example (confirmed by same BGS serial number). It was sold from two different eBay handles but both were shown to be located in the same city, which is suspicious. The first auction closed at $760 while the second auction ended at $455, which I think is the actual legitimate sale. 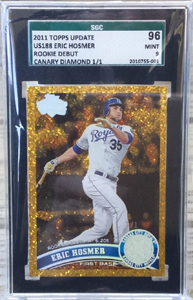 Every time I see this Eric Hosmer Canary Diamond card, I'm reminded of how it was marketed before it was finally sold at auction. For many months, the seller tried tirelessly to sell this card for an unbelievably high price. We are absolutely serious about our $5,000 asking price for the Eric Hosmer Canary Diamond. From what I saw, most of the marketing was done via Twitter. Needless to say, collectors couldn't take the seller seriously and lots of price-related flak tweets were published. 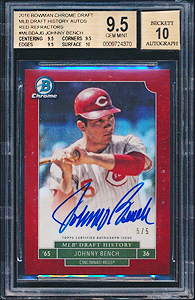 After several unsuccessful attempts to move the card for the outrageous asking price, the seller finally came down to earth in early April and listed the card auction-style - End Price: $338. This is a perfect example of how our own personal attachment to a player, team, or card doesn't always translate to actual market value. I haven't seen the Stephen Strasburg 2010 Bowman Prospects Orange AU since 2010. With a print run of just 25 copies, it's entered unicorn territory. I actually attempted to win this card in the last moments. It's an elusive card we just don't see anymore. 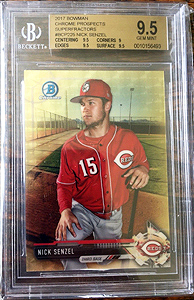 The Nick Senzel Superfractor was an interesting one to watch. I like that it doesn't feature an autograph. I've been keeping an eye on this guy's stuff over the past several months and it's been very popular on the auction block. When I saw this card, I had to watch it. I considered placing a last minute bid but since it felt more like an impulse buy, I figured it was best to archive it here and keep my money. I still really like the card. Joc Pederson stuff has really come down. I remember when this guy was super hot back in 2015. 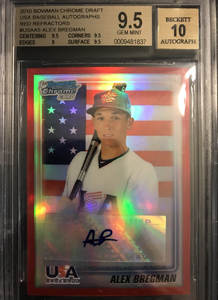 The fact that his RC Superfractor AU BGS 9.5 sold for $255 floors me; it really does. I was tempted to bid just because the deal was so good. Regardless of player performance, I think this is a very special addition to any collection. 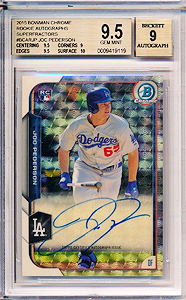 Note: There's another version of this Superfractor that features a different photo of Joc in a white jersey. The Adrian Beltre Mirror Black AU /1 is an excellent card. 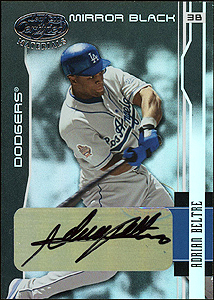 The 2003 Leaf Certified Materials set is one that showcases the sticker auto thing tastefully. I don't mind seeing these; I think it's because the design without them is already so appealing. The Johnny Bench AU is one I just plain like. The red borders, nice photo, and beautiful autograph work so well together. That it's a BGS 9.5 and printed to just 5 copies certainly doesn't hurt either. What a rad card to have. 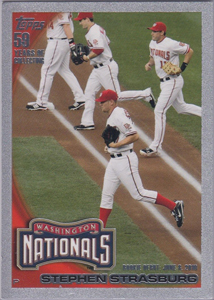 Stephen Strasburg 2010 Topps Update Platinum is a first appearance for me. Strasburg is featured twice in the Update set and I always thought the photos selected for these two cards seemed somewhat haphazard, almost as if the photo submission deadline was too near to pick something better. Regardless, however, the Platinum parallels, with print runs of just 1, are some of the most elusive of 2010. I actually tried to win this one and lost only marginally. I really like this card.